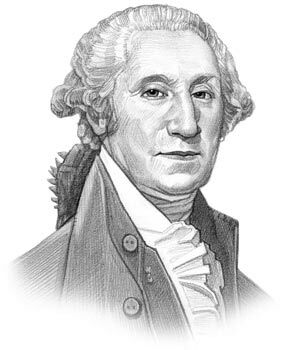 George Washington was the first President of America and served in office from April 30, 1789 to March 4, 1797. The US Constitution was adopted just before he became president. The original US Constitution was put into writing on September 17, 1787 by the Constitutional Convention and is housed in the National Archives in Washington, D.C. This section contains the history and origins of the US Constitution with further access to additional, more detailed facts and information. The US Constitution articles provide interesting facts and information about the US Constitution in a simplified format that is ideal for kids, schools and homework. Articles include the US Constitution Simplified, the Preamble, the 7 Principles of the US Constitution and the full text of the Constitution. Interesting historical information is detailed in the New Jersey Plan, the Virginia Plan, the Great Compromise, the Slave Trade Compromise and the Three-fifths Compromise. This section provides access to an overview of important historical events that led to the US Constitution, the plans and compromises that were made and a simplified overview of the history of the US Constitution, such as when it was written, when it was ratified, who wrote it, the original text with an explanation and a simplified summary of the content. The following articles on the document, the plans and the compromises provide an overview of the US Constitution in simple terms that are ideal for kids, schools and a helpful educational resource. 7 Principles of the Constitution and Government - The 7 Principles of the Constitution that provided the foundations for the US government. US Constitution Simplified for Kids - A simple guide to the Constitution of America. Original Constitution Text - Read the original text of the Constitution of America, a great educational reference tool. Preamble to the Constitution - The Preamble, or the introduction, of this important document provides the text and explains the reason and the purpose of its content. The Constitutional Convention - The Philadelphia Conference, which became known as the Constitutional Conference, met between May 25 - September 17, 1787. Its delegates wrote the Constitution in just 114 days. The New Jersey Plan - The New Jersey Plan, also known as the Small State Plan, consisted of 11 resolutions and favored equal representation in which each state had the same number of representatives. Declaration of Independence for Kids - The simplified history of the Declaration of Independence announcing the separation of the colonies from Great Britain - the purpose, reason and names of the signers. Declaration of Independence Text - The full text of Declaration of Independence text, proclamation was adopted July 4, 1776. Discover the definition and meaning of the 7 Principles of the Constitution and Government which are Popular sovereignty, Republicanism, Federalism Separation of powers, Balance of Power - controls (checks), Limited government and Individual rights. Learn about the original Constitution of America that was put into writing by the Constitutional Convention and is housed in the National Archives in Washington, D.C. This section contains full facts, history and information. The US Constitution Simplified provides the answers to FAQ's (Frequently asked Question) about the US Constitution in a really simple question and answer format - ideal for kids, schools, colleges and homework. The Original Constitution Text consists of the Preamble and the reasons why the 13 original colonies separated from Great Britain to become an independent country and the 7 Articles of the US Constitution. Article 1 deals with the Legislative Branch, Article 2 the Executive Branch, Article 3 deals with the Judicial Branch, Article 4 addresses States' powers, Article 5 Constitutional Amendments, Article 6 addresses Federal powers and Article 7 deals with Ratification. There have been a total of 27 amendments to the original Constitution text. Learn about the history of the Constitutional Convention, aka the Philadelphia Convention, was a political conference held 1787 attended by state representatives from the former Colonies who together framed the constitution of the United States. The Virginia Plan consisted of 15 resolutions proposing a system of government to the Constitutional Convention. The New Jersey Plan aka the Small State Plan consisted of 11 resolutions that were offered as an alternative option to the Virginia Plan. The Constitutional Compromises were made between the large and small states and the North and the South on the subjects of Representation, Apportionment and on Commerce relating to the Slave Trade. The Great Compromise, also called the Connecticut Compromise, resolved the highly controversial issue of representation at the Constitutional Convention in Philadelphia. The Three Fifths Compromise resolved the highly controversial issue of Apportionment at the Constitutional Convention in Philadelphia. The Slave Trade Compromise was that Congress could not stop the slave trade until 1808, but that imported slaves could be taxed. The US Constitution was written 11 years after the Declaration of Independence and 4 years after the American victory in the Revolutionary War. Read the original words and text of the historic Declaration of Independence. The article on the US Constitution provides a summary of one of the most important documents in the history of America, the Constitution. The following video will give you important facts and dates about the political events experienced by all of the Presidents of America.